Peyton Manning Is A Hall Of Fame Tipper Too : The Two-Way When he had dinner in North Carolina the other night, the NFL quarterback added $200 to a bill that already had a big gratuity tacked on. But the 50 percent tip didn't work out so great for the waiter after he put a photo of the bill online. Peyton Manning during the news conference Wednesday in Indianapolis when it was announced that he's leaving the NFL's Colts. The tears over Peyton Manning's departure from Indianapolis have dried ... and it's business time as the rehabbing quarterback starts doing 'eeny meeny miney mo' with his suitors (ESPN reports 12 of the NFL's 32 teams have contacted Manning's 'people'). 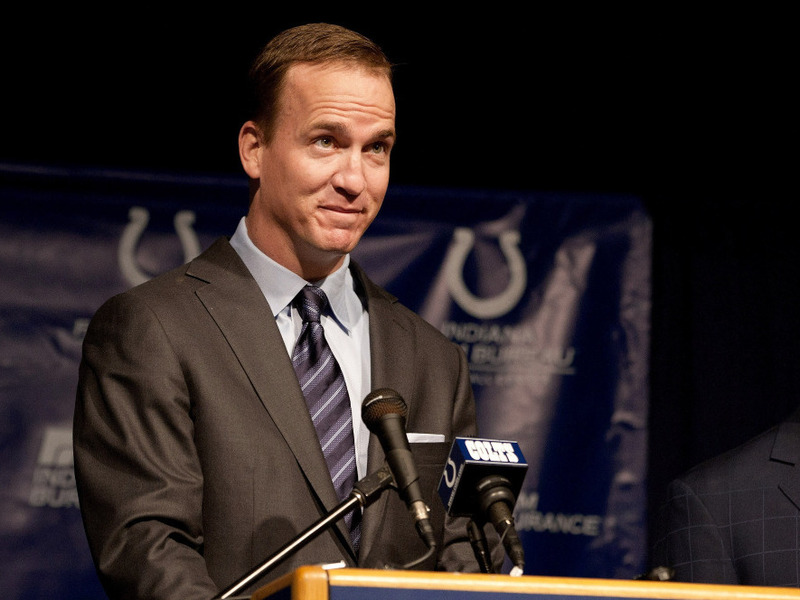 I've heard some snarky sports media people question the sincerity of Manning and Colts owner Jim Irsay's tearful, I-love-you-but-we're-getting-divorced-anyway news conference Wednesday. And there have been questions about Manning's "aw shucks" comments when he landed hours later in South Florida — where he has a home and appeared befuddled by his next move, saying "I haven't thought about teams. I really don't know who's interested." Well, if cynics don't believe and trust in St. Peyton the way Indy residents do — here's something that might cut through the cynicism. I've always judged a person's character, in part, by how he or she treats service people. By that measuring stick, Manning appears to have character above and beyond. About 17 times above and beyond. The other night, Manning had dinner at the Angus Barn in Raleigh, N.C. The bill was for $739.58. That included an 18 percent gratuity. But Manning still left a $200 tip. -- The dinner and drinks must have cost about $627. -- 18 percent of $627 is about $113. -- To bring the 18 percent gratuity up to the generous 20 percent that many folks tip, Manning only needed to add $12 to the bill. -- But he tossed in nearly 17 times more than that. -- Or, you could say he left about a 50 percent tip (the gratuity plus his $200). Yes, it's good to be an NFL quarterback. But let's give Manning the benefit of the doubt and say this was less about a big spender trying to impress by throwing around cash and more about — yes — the character of a guy who got choked up at his Wednesday press conference talking about how he'd miss the Colts equipment manager. Alas, though, this apparent feel-good story has taken a feel-bad turn. The waiter who got the big tip, named Jon, posted a picture of the bill online — that's how we know the numbers and Jon's name. Angus barn owner Van Eure, according to the Triangle Business Journal, was livid and said the server was immediately terminated. "This goes against every policy we have," said Eure. "It's just horrible." Of course this story could have a happy ending if Manning rides in and somehow gets Jon another job. But right now, the timing's kinda bad. Manning's going through the help wanted ads himself.